Fresh from the Stardrift Finals , Jane , Jensen and I made our way to another finals , this time the GRA’s Round 4. Held at the huge parking lot besides the Palace of Justice, Putrajaya, this event had a record number of participants of over 6o people!!!. . Though not impossible , I knew it was difficult for me to be able to get into the top 3, on the overall standing having missed a round in this 4 round series. However , with me doing two ‘wrong courses ‘ along with a corrected run ( where I redid a section where I made a mistake while the time is still running) and a safe run had me plummeting down the score board ,out of contention. Yoong proved to be unstoppable again by posting 2nd fastest time of the day. He settled with 2nd behind Andy Kow in the final overall scores but who know what the outcome will be if he had not missed the 2nd round . Two drifters made their appearence with in this event too, Derek Lim and Mervyn ‘Nangka Murah’ Mohd with Mervyn placing 1st for novice OD ( i think :)) for this round!! 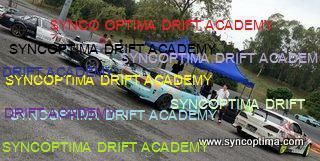 This entry was posted in AutoCross, Autokhana, Posting by Ariff on December 3, 2009 by skagee.